It wasn’t very long ago that I shared my kitchen update at the studio, but I think I’m about to start work on it again. Very soon. Wait, what?! Well, the kitchen project was always a temporary fix to a larger cosmetic problem. And things are coming together for a bigger (more complete) remodel faster than I thought they would, now that I’ve spoken with a contractor, etc. NO TURNING BACK NOW. Well, I guess I can probably still turn back if the quote is crazy high, but I’m pretty excited / motivated to move forward. So, we’ll see. 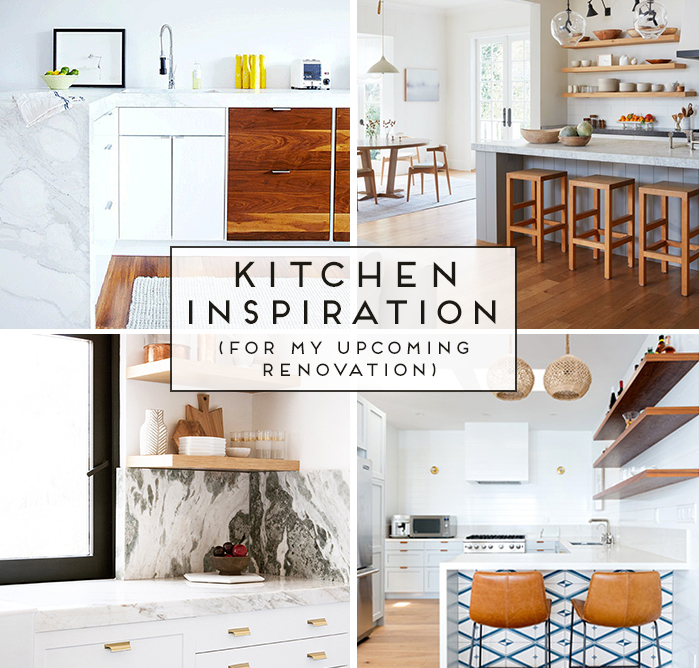 To celebrate a new chapter in this interesting little kitchen journey that I seem to have us all, I’ve put together a bunch of inspiration for the new, NEW studio kitchen reno today. There’s a lot I want to do, but the plan is to keep what I can salvage (appliances and base cabinets), demo the things that have been driving me crazy, and upgrade the rest. New countertops! One of the biggest changes I’m planning to make is to the counters. I’ll be 1) removing the tall pantry, which I never show in photos because it’s so ugly, 2) extending the counter out and lowering the bar, so the counter is all one level, and 3) getting brand new countertops. I haven’t decided on which way to go on the type of counters I want yet, but I do like the look of natural stone. Specifically marble and quartzite, since they’re one-of-a-kind and would help make it feel more like a home to me (I think). Plus they’re sustainable and long-lasting. Not a bad combo. What kind of counters do you dream about having in your home? 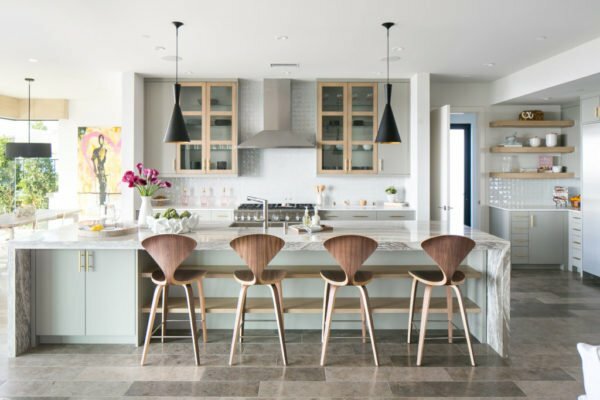 If you’re thinking about using natural stone for any of your upcoming renovations (marble, quartzite, granite), check out the MIA+BSI: The Natural Stone Institute website at www.usenaturalstone.com. 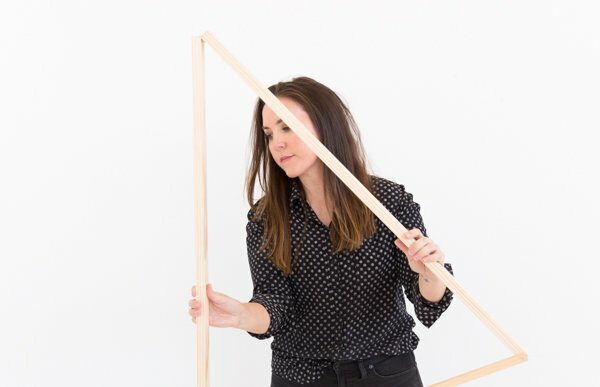 I’ve partnered with them on this post and have consulted the website a bunch already, trying to figure out what types of counters would 1) look the best for my aesthetic and 2) stand up best to my workflow in the studio kitchen, etc. 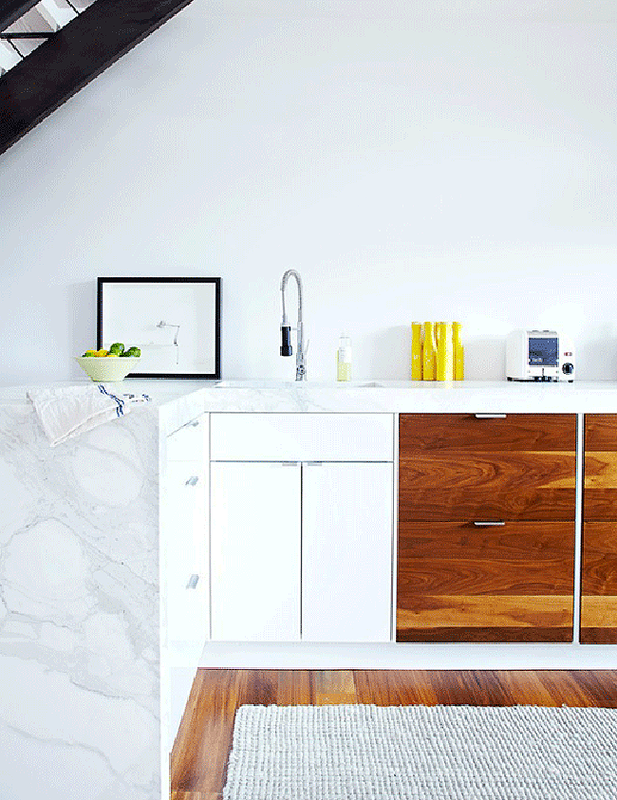 There’s tons of info on natural stone and inspiration for renovations, etc – super helpful. 1. I’m finding high-contrast kitchens super inspiring right now. Dark cabinets look really good with light marble counters. Don’t you think? Via Amber Interiors. 2. That quartzite countertop looks so classy in combo with the vertical shiplap underneath on the island. And you kind of can’t go wrong with a natural stone like this, right? Especially in a unique, breezy / casual space this like one. Via Coco Kelly. 3. 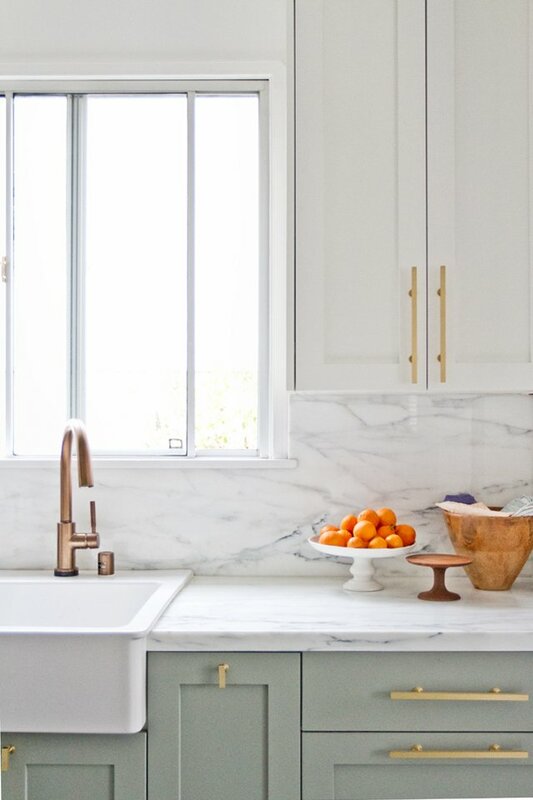 I don’t think I’m going to be able to do a waterfall edge, like this thick carrara marble countertop from Jessica de Ruiter on C Home, but MAN, I would LOVE to! 4. Another marble waterfall edge. Gah, this looks so, so good. Via Ashley Capp on Desire to Inspire. 5. Look at that massive, quartzite island from Black Band Design. The striations are so pretty when you look at it up close. 6. 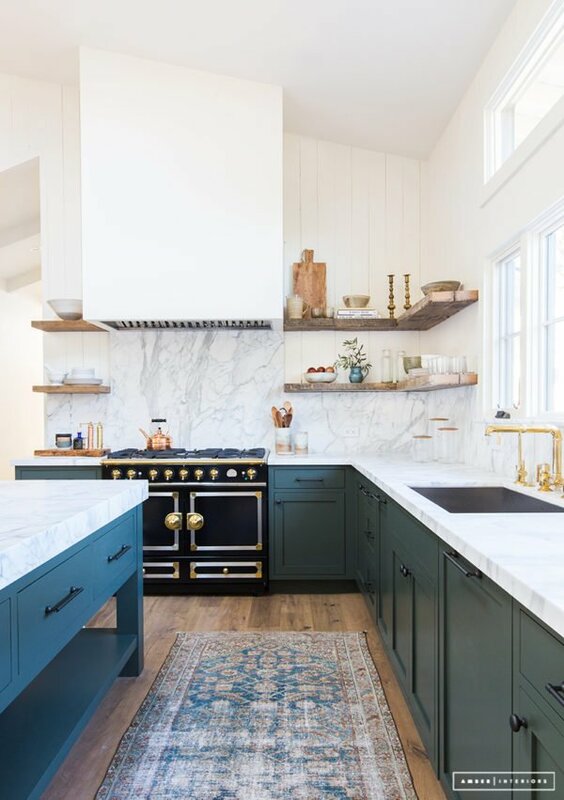 I’m not typically a huge fan of dramatic veining in marble, BUT the kitchen of the Trullbook home that Sarah Sherman Samuel designed is stunning. It adds so much visual texture and interest to that corner. Don’t you think? It’s green tweed marble, btw. 7. 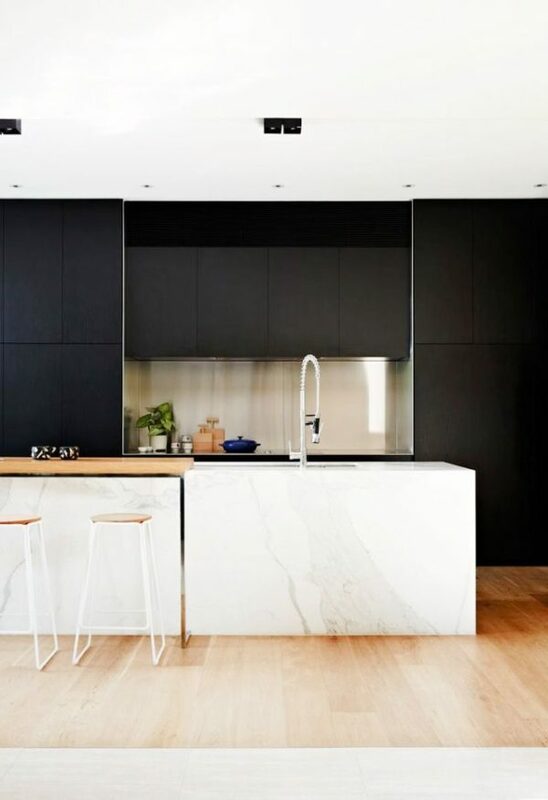 Have you seen anything more sleek than this high-contrast kitchen via Contemporist? That marble makes quite the impact. 8. 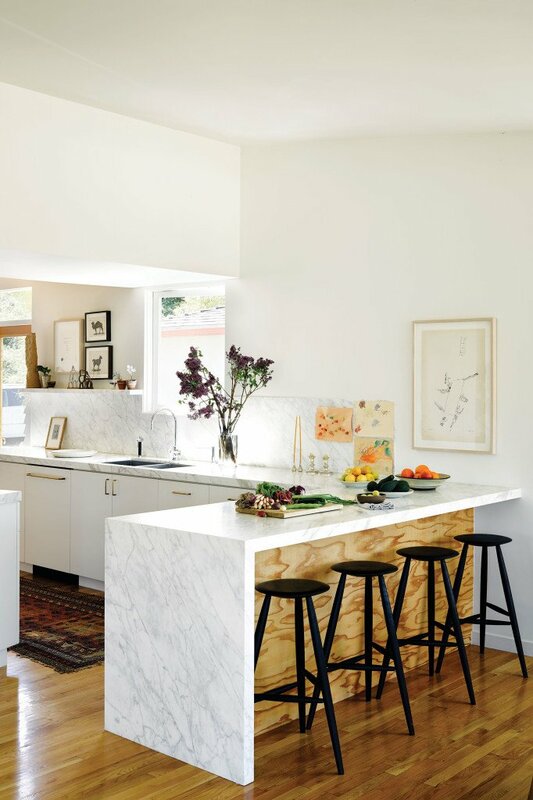 And, last but not least… More evidence of awesome marble counters (this one is Calacatta Marble). Via Sarah Sherman Samuel. I also really love that cabinet color, mixed with the brass drawer pulls. What about you? What do you think I should choose for the studio reno? Marble, quartzite, granite, or something else entirely?! I’m all ears. Let me know in the comments below. This post was sponsored by MIA+BSI: The Natural Stone Institute. Visit them on Facebook @usenaturalstone. All opinions are my own. Thank you for supporting the brands that help keep Paper & Stitch running. 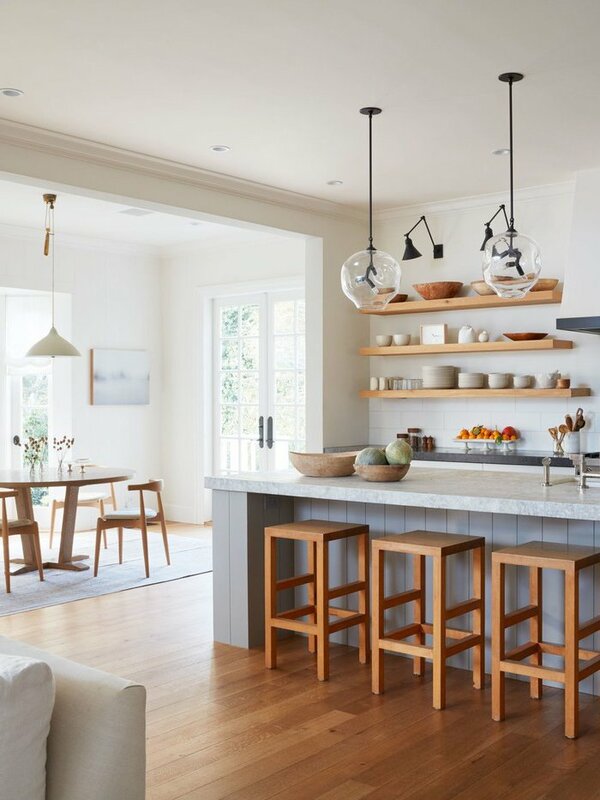 I really like the white countertop, especially in combination with the dark wooden cabinets. Looks great! Agreed Michelle. Good combo for sure. All of these kitchens are so cute! I love how fresh and modern they feel. I love the look of the waterfall countertops! Me too Paige. I would love to do that in the studio kitchen! 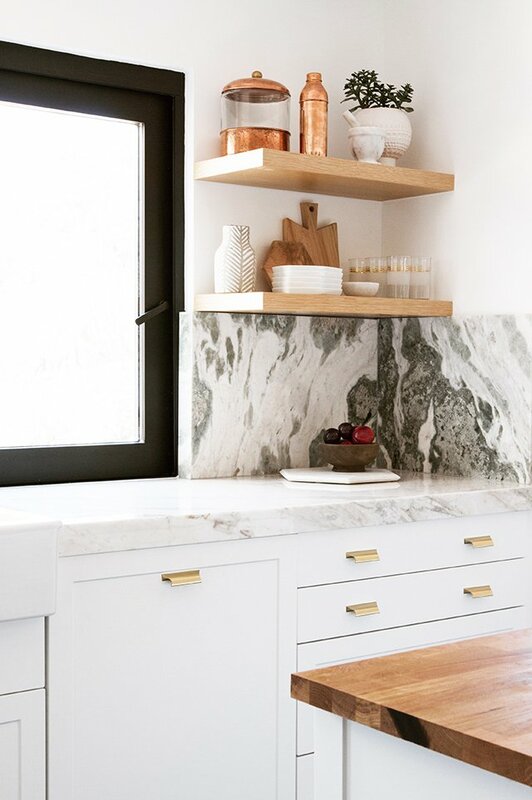 I really like the contrasting dark cabinets with pretty light marble or quartz countertops. Those waterfall counters make me wonder if the vertical section could be faux painted. Even a blend of painted colors mirroring the colors of the marble or quartz on the vertical side would give a waterfall impression. Too bad I don’t have a place to try it out! Interesting though, Olivia. That had never occurred to me before. It could be interesting DIY, though I’m not sure even the most skilled faux painter could create something as good as the stone itself. BUT it’s definitely a budget-firendly option. I LOVE the touches of gold hardware. Those shelves are nice and tight to the walls. 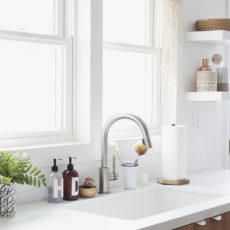 What type of floating shelf brackets are they?